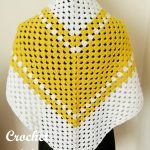 Free Crochet Pattern-Juliette Shawl – This stylish shawl can be worn in a few different ways, it is made in a medium worsted weight #4 yarn using a 6.00mm hook. 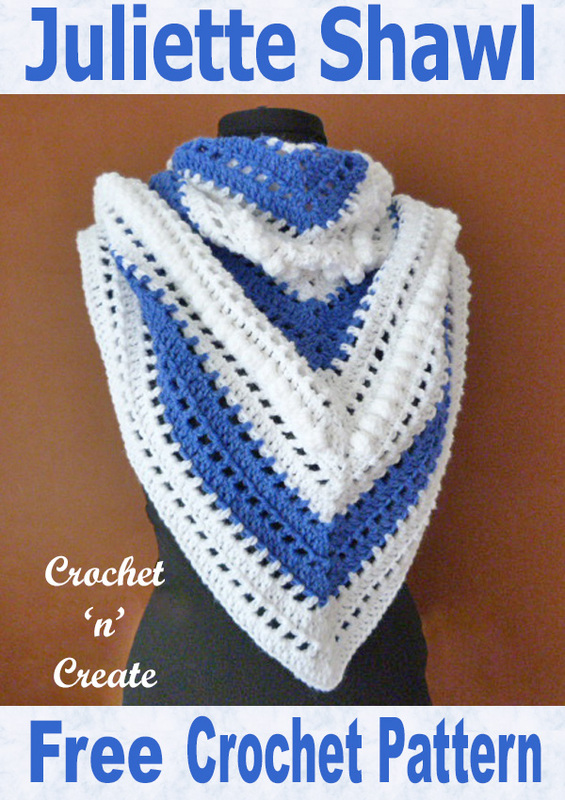 I have designed it using a simple double crochet and bobble stitch pattern, so hope you enjoy making it. 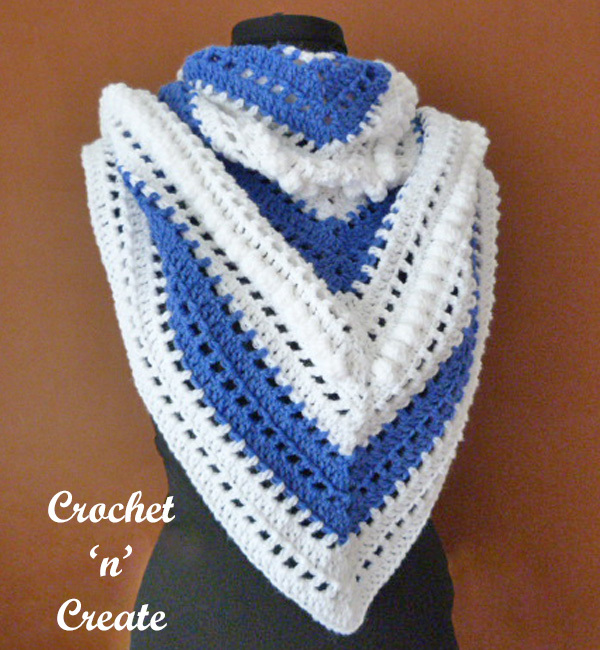 The sample was made in Lion Brand Pound of Love yarn in colors White and Denim. See more of my shawls and wraps with the links below. dc5tog. Leaving last loop of each dc on hook, work 5dc in next dc, yo pull through 6 loops. Row counts will increase as you go on. 8th Row – ch4, 1dc in base of ch3, ch1, skip 1sc, * 1dc in next sc, ch1, skip 1sc, * rpt from * to * to ch2 space, (2dc, ch2, 2dc) in ch2 space, ch1, skip 1sc, rpt from * to * to last sc, (1dc, ch1, 1dc) in sc. Turn. 9th Row – Rpt 5th Row. 12th & 13th Rows – Rpt 4th & 5th Rows. 14th & 15th Rows – Rpt 4th & 5th Rows. 16th & 17th Rows – Rpt 4th & 5th Rows. 18th Row – Rpt 6th Row. 19th Row – Rpt 7th Row. 20th Row – Rpt 8th Row. 21st Row – Rpt 5th Row. 34th & 35th Rows – Rpt 4th & 5th Rows. 36th & 37th Rows – Rpt 4th & 5th Rows. Fasten off. Join color 1. 38th & 39th Rows – Rpt 4th & 5th Rows. 40th Row – Rpt 4th Row. 41st Row – ch3, 1dc in each ch1 space and dc to ch2 space, (2dc, ch2, 2dc) in ch2 space, 1dc in each dc and ch1 space to 3tch, 1dc in top of ch3. Working along top of shawl (the long side opposite the v shape) – Using color 1 work one row sc evenly to end. Fasten off. 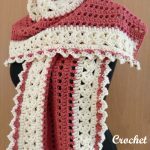 The written instructions and pictures for this free crochet pattern-juliette shawl are copyrighted to crochet ‘n’ create © 2018. 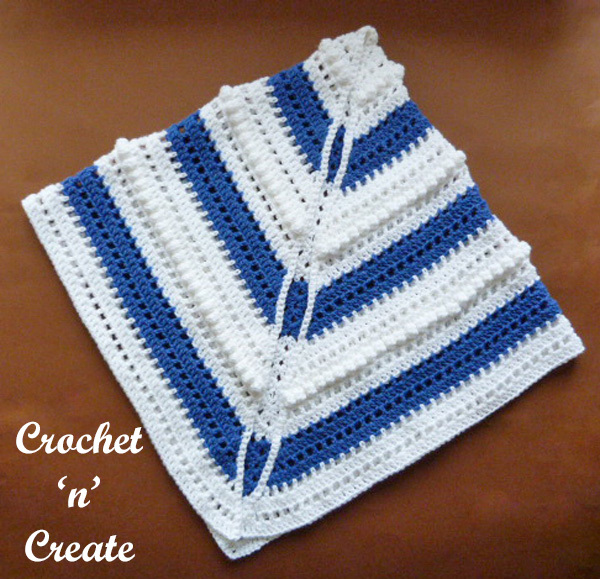 You are welcome to sell the finished products made from the free crochet pattern-juliette shawl, I just ask that you please use your own pictures and put a link back to crochet ‘n’ create. 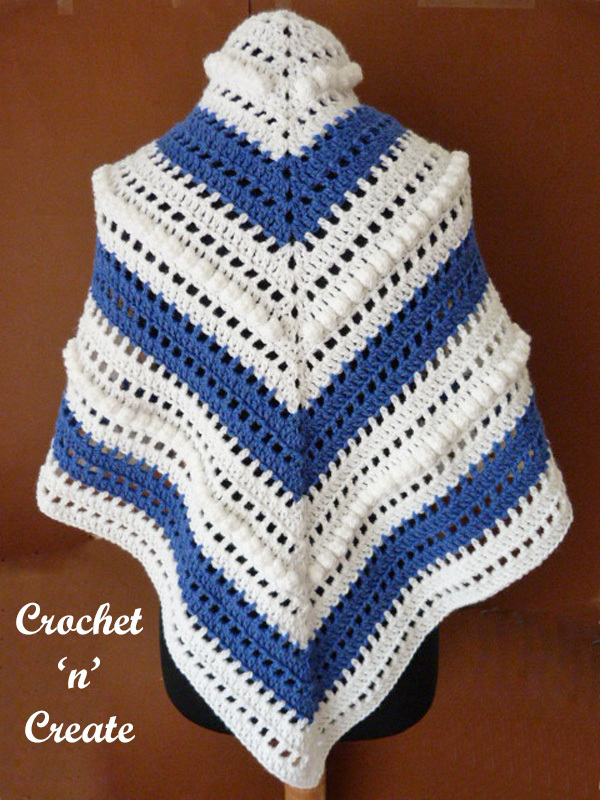 DO NOT share the written instructions for this free crochet pattern-juliette shawl. 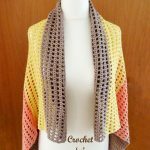 This entry was posted in crochet ladieswear, crochet shawls and tagged crochet, crochet ladieswear, Crochet Shawl, crochet wrap on 13th October 2018 by crochetncreate.